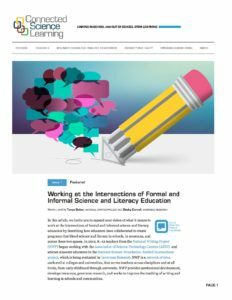 Summary: This resource describes the NWP’s multi-faceted work (with collaborating organizations) on the Intersections Project, which supported local partnerships to design programming and innovative projects to connect science and literacy learning. The authors present two cases and their benefits to participants: one focuses on enhancing museum/science field trips and the other describes a STEAM partnership project (Science, Technology, Engineering, the Arts, Mathematics) between a writing project and a local science/engineering discovery center. Video, art, and student reactions are embedded. This resource could provide schools and teachers with ideas about partnerships with area museums or science centers, as well as literacy integration for science, STEM, or STEAM learning. ‘The underlying principles of making—the open-endedness, the student self-directedness—I have pulled and worked into other class assignments, too, and changed the way I teach and the way my students go about learning. When students know they have to figure things out, and I am there to support them; the whole dynamic of my class changes throughout the whole year. And when the learning that happens in science class intersects with learning in language arts class, where students can translate their learning from one class to another, it has gotten more kids engaged. And the students take what they do when they are making and apply it in their science work and in their language arts work. When we have the space for students to make, where it isn’t scripted and the notion of trying again is a big part of it, their attitude[s] change. When they have a problem in front of them in science class, they aren’t as afraid of not having the right answer or not getting it right the first time. And this translates to the writing my students are doing—they are more likely to jump in and get words down on paper. So this gives the students the chance to think about how the skills they are learning through [making] are the same skills they need to be writers, scientists, and learners in general.